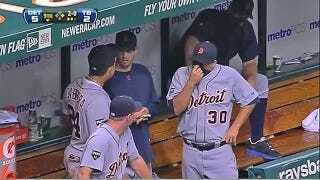 This Evening: Who Farted In The Tigers' Dugout? Your p.m. roundup for Aug. 23, the day food hoarding made us change the channel. Photo via SportsGrid. Got any stories or photos for us? Tip your editors. What we're watching (all times EDT, unless noted): MLB Network has Red Sox-Rangers or Braves-Cubs at 8, plus White Sox-Angels at 10. ESPN2 has a Little League World Series game at 8. FOX Sports Net has Bayern Munich-Zurich in Champions League soccer at 8 (tape delay). And ESPN2 has New York-Phoenix in a WNBA game at 10. I think that&apos;s what moths do. I&apos;m not a damned lepidopterist.